Fall 2014 - After 3 good great years for growth, things are changing fast. 2014 I plan to spend a lot more time in the woods again this year. I am reducing my umpire schedule to allow me to make longer stays at the farm. Transplant Oak seedlings from personal nursery in Madison. Mix of Red Oak and White Oak (Burr Oak). Clear fenceline with west woods (Hurley's Woods.). Clean up yard from barn takedown. Watch Eagle pair as they raise their young. This is the third year this pair has been in this nest. There were two young. In the fall I seeded white and red Oak acorns into barnward and along bottom edge of old windbreak, in west windbreak, and by chestnuts in spruce patch. I've gotten out of the habit of ordering trees; I haven't been ordering pine seedlings the past few years because I have had a few hundred hardwood seedlings every year, from my own nursery, to transplant and I would like to increase the populations of hardwood on the farm. Right now the percentages (HW to SW ) are pretty low. I thought maybe this would be a project that my brother would be interested in tackling. He enjoys coming out to the woods and pruning is getting pretty hard now that the trees are big and he has always enjoyed planting trees. I would like to re-establish pine in the area on the north hillside that we used to call the windbreak. 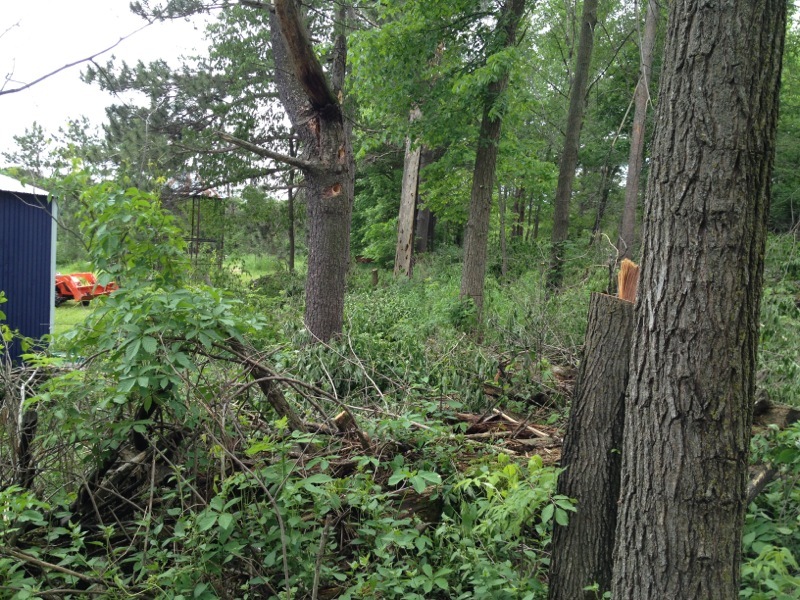 It was descimated by logging and by subsequent wind storms and I've been fighting brush (and winning) in the south side for the past few years. It may be open enough now for pine to survive. Time to pick up the trees. Every year the county sends a truck down to the DNR nursery to pick up the seedlings that were ordered in Polk County. This year it was a couple weeks earlier for some reason and the morning it arrived we had a nice snowfall. 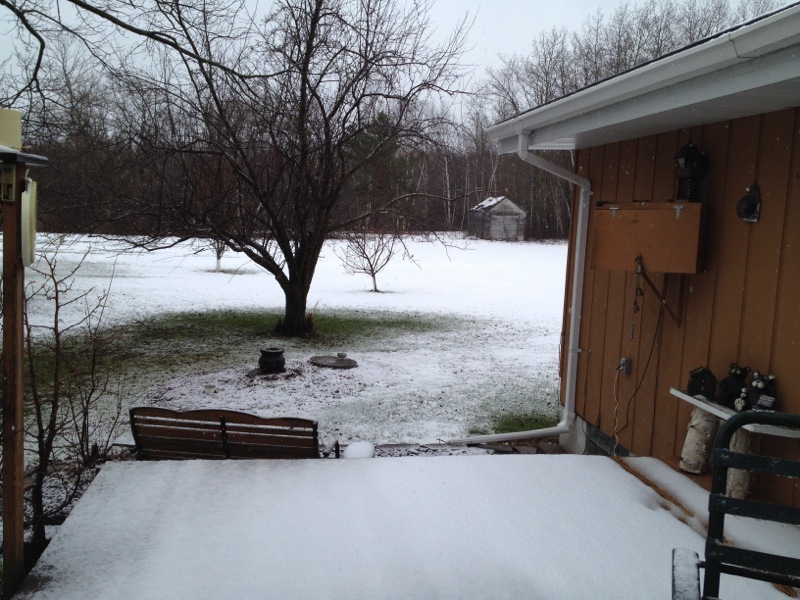 I have planted trees in the snow in years past but I was glad when this snow melted by the time I got the trees back to the farm. Seedlings unpacked from boxes and in buckets with a little water on the bottom to keep the roots hidrated but not drowned. (Actually this is only half the seedlings. I only unpack those I will plant in a session. I am working alone today and this is as many as I can plant in one day.) My brother cannot come until Sunday. This is my nursery. It's located in my back yard in Madison. 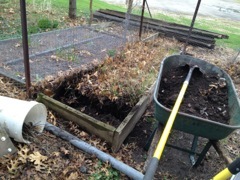 It's a framed bed aproximately 4 feet by 8 feet and is filled with compost before spreading acorns on the soil surface and covering with 1/2 in. mesh screen to keep the squirrels, mice, and chipmunks from eating my seed. The screen stays on for the first season of growth otherwise the squirrels will dig out (or pull out) all the young seedlings to get at what remains of the nut. These seedlings are going on their third growing year and are ready to transplant - before they break dormancy. 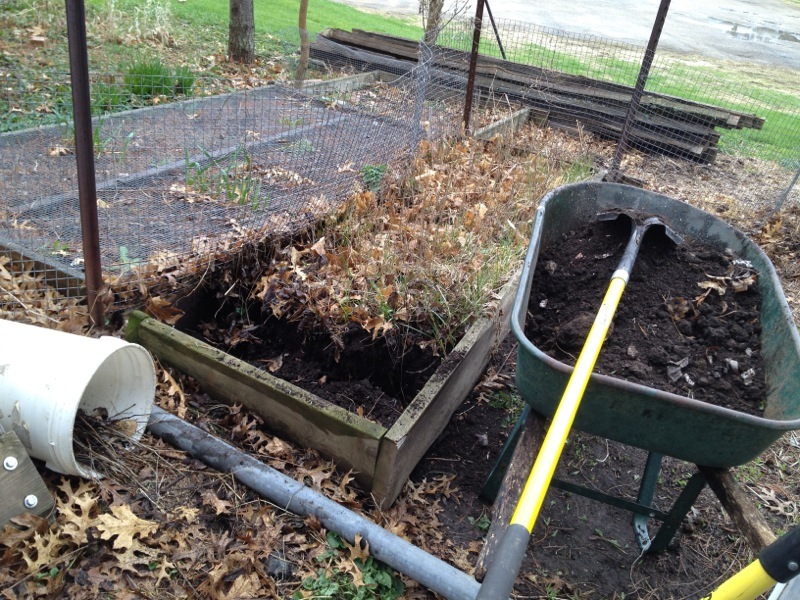 i dig them as deap as I can - to get as much of the taproot as possible - shake off the dirt and put them in a bucket. I cover them in damp peat or sawdust and keep them in the cool shade for less than a day before loading them up to the farm. 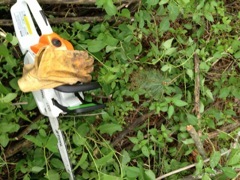 This year I counted 600 seedlings of mostly white and burr oak. These nuts were gathered in the fall of 2010 from Warner Park, UW campus, and other locations around Madison. The first day I planted inside an area that was once a triving pine/spruce woodlot. Growing up we called this 'The Windbreak' since it sat to the north of the farmstead and along the hillside facing the south. It is about 3 acres and for the past 4 years I have been aggressively fighting the underbrush that had taken over after the canopy was opened by a blowdown of the pine/spruce that remained after "a thinning" timber sale. You can see the young transplants in the rubble. I tried to plant trees about two paces apart in rows that are about 5 feet apart. (this is difficult because of all the downed trees and dead underbrush to navigate around). I have only managed to clear the south half of this area so that is all that I planted. I planted aproximately 500 of the Red and White Pine - alternating each as I planted. This photo shows the progress of teh seedlings in the windbreak. The annual plants are beginning to grow but these shouldn't be too much conpetition for the young seedling. It has been a wet spring and the transplants are doing very well. to give light to seedlings. Over the years that I have been cutting and poisinging underbrush in this area, I have left some hardwoods grow. These are mainly 'piss' elm, green ash, black cherry, and some hackberry. In an effort to favor these young seedlings I am either cutting or girdling these big trees to open up the canopy. Elm will never be much good. 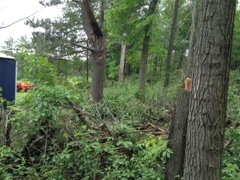 Ash will sucumb to the emerald ash borer. Black Cherry is a nice tree but almost all are either crooked or damaged - I am sparing high quality individuals. Got on tractor and set out to tour the farm. Only got to the old tree stand in the windbreak (from Hibbings). This has been a thorn in my side for years and it sets a bad example for current hunter (implies that I tolerate such thing.) hooked cable around deck and pulled it down. Took two pulls and it was down. Two of the trees are dead. Removed LONG screws and all nails from remaining live Pine. Pulled mess into woods. Andy and his dad were heading back to kill some wasps that had made a home in one of their stands. I told them what I was doing and that I’d evicted the guy who built that stand. (made an impression, I think). Then headed back to the north fence. I hardly recognize the woods only after one year growth. The landscape is changing so fast. 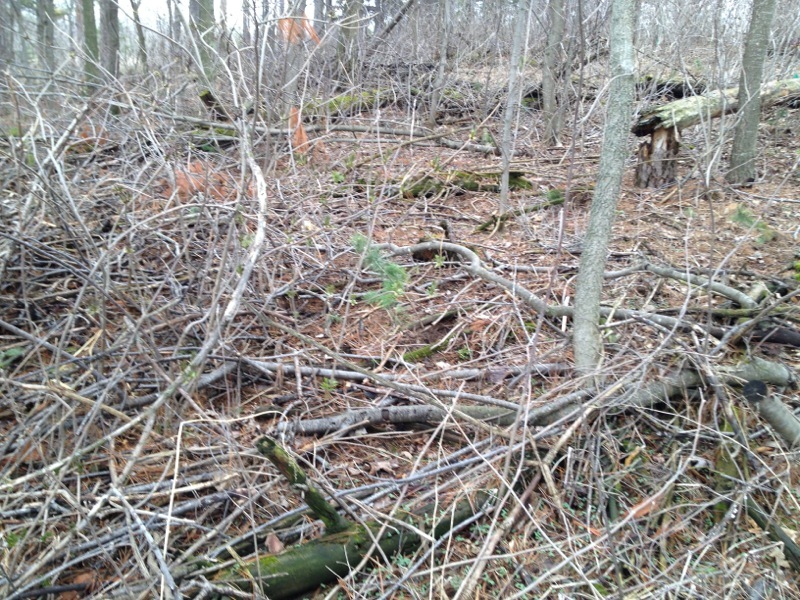 The area I pruned up the past two years: the canopy has closed in again and the ground is very dark. Another couple years and it will be time to prune again. Ended up at the back-40. Poplars aren't very impressive. Maples are in good color and there is a lawn of baby maples all around. Why don’t these ever survive. There is only one young maple in the area and back by the old pines. 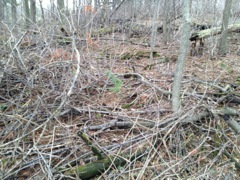 I got to the old pines and hogged down a thicket of prickly ash at the south side. then started pruning the pine (scots pine and spruce). Opened up around Jim's stand and cut the stairs out of a tree stand tree. Then worked my way north to the fence. Pruning up the pine and cutting out dead trees. 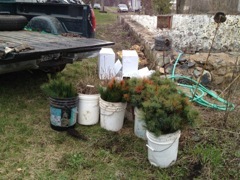 I culled a few ‘ugly’ pine to make room for spruce. There were many dead (or dying) spruce along the east side. Opened up for remaining spruce by taking out some more ugly pine. Made it to the north fence before I wore out. There is Elderberry taking hold in areas there which need to be sprayed in the spring. I cut what I could. I hate thickets.